As world governments pursue policies designed to meet their increasingly challenging carbon emissions targets, companies are expected to respond to the climate change agenda and to pursue and explore new opportunities. For those that can successfully make the transition – as some leading players already have – the allure is faster growth in a burgeoning sector. 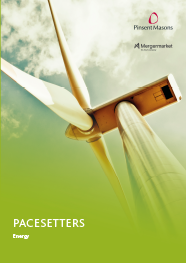 According to our survey, more than three-quarters of fast-growing energy businesses (77%) anticipate that major utility and oil and gas companies will move into the renewables sector in the near future. That is already happening: major European businesses such as BP and Shell have already made high-profile moves in the industry. The switch represents a means for businesses in potentially slower growing – or even stagnant – sub-sectors of energy to secure a boost. Almost two-thirds (61%) of respondents in our survey cite wind power as most likely to offer additional opportunities for investment over the medium to longer term – almost twice as many as those that pick the next most attractive sub-sector, solar (31%). Wind turbines have become larger and more efficient over the past few years, making offshore wind an important part of Europe’s energy mix. However, costs in the planning phases are significant, given the time lag from conception to delivery, project rights and funding. It is therefore important for companies to have certainty in energy policy and tariffs in order to support such investment. The preference of European companies for wind and solar power almost certainly reflects their view of where capacity is likely to be added most rapidly in the years to come. In Western Europe for example, 58% of fast-growing companies see offshore wind offering the greatest scope for adding capacity, with a further 3% citing onshore wind. This is followed by photovoltaic solar panels, highlighted by 44%, and thermal solar, cited by 38%. In Europe, wind power – particularly offshore wind – has become much cheaper to generate, making it very attractive to investors. In the UK, for example, the winning bids for some recent large offshore schemes are a third of the tariff price they were just a few years ago. Offshore wind can generate more electricity and can be scaled up without requiring tracts of land onshore. Outside of Europe, however, the global energy sector offers a slightly different picture: more than three-quarters of fast-growing energy companies (76%) see hydropower as likely to see capacity growth over the next three years – China and South America, for example, have been investing heavily in hydro. Offshore and onshore wind (15% and 14% respectively), meanwhile, are eclipsed by nuclear (23%) and biomass (19%), as well as solar. While energy companies are excited about the growth prospects for renewables, they are not expecting to make a wholesale switch into this sector from their traditional industries. The growth of the electric vehicle sector where currently European findings have shown that over 80% of charging occurs at home, for example, may give rise to additional demand for generating power for charging, particularly off-peak. In the shorter term at least, fossil fuels may be required to meet that demand. Nevertheless, many businesses are clear about where their most profitable opportunities now lie. “Not moving to renewable energy sources quickly enough has been the biggest reason for not achieving the growth that we may have expected,” says the CEO of a German energy business.